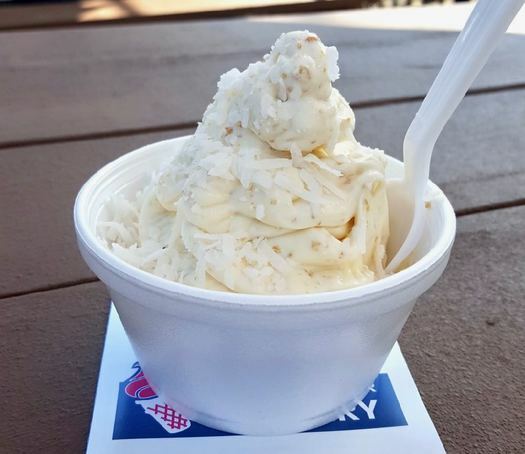 The lies we tell ourselves as adults: It's completely fine to eat ice cream -- just ice cream -- as a meal if 1) you skipped some other meal in the day, or 2) you've been sick/it's been a bad day, or 3) it's the only viable thing you can really bring yourself to make. The guilt association or judgements of ice-cream-as-a-meal are laid to waste when you add in some sort of traditional meal fodder -- for instance, cereal. 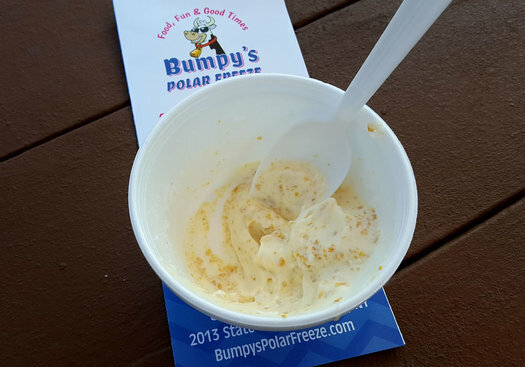 Bumpy's Polar Freeze in Schenectady understands. If you look at the online menu, you won't find the cereal sundae listed, nor is it immediately recognized among the extensive menu selection that frames order windows. 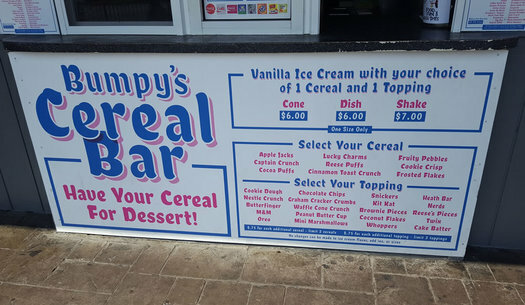 Instead, under the window counters, at about knee height, a three-step cereal sundae chart is presented in a slightly conspicuous way as though Bumpy's is saying, "Listen, we're not proud of the fact that you're eating ice cream before noon, either. But we're not going to stop you." + Start with vanilla ice cream and choose your means of cereal ice cream delivery: cone ($6), dish ($6), or shake ($7) (upstate New York's answer to the cereal milk craze in New York City). + Choose a cereal from there. Bumpy's ignores the "good for you" cereal options like Cheerios and Grape Nuts and goes straight for the "Is this actually candy?" category: Fruity Pebbles, Lucky Charms, Cocoa Puffs, Apple Jacks, etc. + Select a topping to round out the experience, which lean towards "actually candy." Kit Kat or Snickers pieces are listed with Nerds, mini marshmallows, cookie dough bites, brownie pieces, and about a dozen others. The entire thing is strangely delicious, even for a non-cereal lover like myself. I was worried the entire combination would be simultaneously dense and soggy. Wrong. It was smooth and rich (likely thanks to the air whipped in by the agitator on the Flurry machine). And the cereal flakes -- even though they were chipped up and pulverized into specks of their former selves -- remained crisp and crunchy. With the long summer we are having and this week's early fall heat wave, having ice cream for breakfast (or cereal for dessert) is nearly mandatory. It's a wonder no one started offering cereal-spiked ice cream sooner. Please see my "name" above. But like Conrad's fascination with the abomination, I cannot look away from this monstrosity. Maybe it's the diet talking, but I kinda want one. My hope is that this is a hard ice cream base and not a soft serve one. Given the price, I'd expect something hard. But if it's like a blizzard, then maybe it starts off soft. Yo, how much sugar is in cereal anyway? In granola and flavored yogurt? This is just a frozen version of those things. Definitely soft ice cream. I'm not sure I'd be as enthusiastic with, say, Reese's Puffs, but what I ordered was tasty, indeed. Ice cream with cereal toppings is not new, people - don't be afraid! One of the best ice cream flavors I've ever had was 'secret breakfast' at Humphry Slocombe in SF years ago - it's bourbon and corn flakes! And the froyo chains have been offering cereal toppings forever. Fruity Pebbles is the best topping on Pinkberry (is that place even still a thing?) so this does not surprise me and I am 100% checking it out this weekend.